Click for directions: Classes are held @ 3201 NE 148th Ave. Portland, Oregon 97220 (bottom floor of the River Crest Community Church, park in the lower lot enterance in the rear). Only $20 a class! $15 a class for Guild Members. First time? Only $10! A lifelong resident of the Pacific Northwest, Paul is a versatile artist and winner of numerous awards. The grandeur of the Olympic Mountains, the drama of the Pacific Ocean, and the serenity of the streams and waterfalls of the Cascade rainforests, are a constant source of creative imagery. Love for water, and the constant interplay of motion and light upon this subject has become an area of personal focus. Crashing surf, cascading streams, or tranquil still waters are favorite themes. While oil is a primary medium Paul also studies and enjoys the spontaneity of Watercolors as a medium. Having taught in the Portland Recreation System for years and performed workshops in a variety of venues, Paul now enjoys presenting classes and workshops to outside organizations when invited, and routinely presents at the Portland Fine Arts Guild where he currently serves as President. Instruction in basic tools and materials for oil painting including: Grounds: canvas, canvas board, panel, paper, hardboard, etc. Tools: brushes, painting knives, palettes, thinners, mediums, etc. 1. Demonstrating how to generate a sense of brightness such as a sunset glow. 3. Capturing motion in a basic wave. Color, Light and Beauty inspire Karen Ilari’s art. Ilari discovered her love of painting mid-life, after a career in accounting. After all the left-brain work, and after raising her three children largely on her own, she was searching for a way to bring more joy, creativity and happiness into her life. Through college coursework, workshops and books, she discovered a whole new world to explore. Having worked with pastels, watercolor, oils and colored pencil, she settled on acrylics for their unique properties. Fast drying, forgiving and richly colored, acrylics give her the ability paint fearlessly, taking risks, changing direction, and generally going wherever the painting wants to lead. Ilari initially leaned towards realism and natural color with her paintings, but her focus currently has moved to a more loose, impressionistic style with vivid and often unexpected colors; from a more detailed, controlled process to one that allows for more spontaneity and creativity, while still maintaining recognizable subjects. Ilari has taught locally at Portland Fine Arts Guild and at the Oregon Society of Artists, as well as in her home studio. She also creates video coursework for You Tube, and for her Online Acrylic Painting School. In this workshop we will learn and practice techniques and tools for painting loosely, creatively, and spontaneously. We will push our subject matter, and ourselves, to step out of our comfort zone and answer the question “What if?” What if I try this color, move this element, change this background? “What if” ignites creativity and exploration and fun! The Quick Sketch: We will work from simple landscape photos, so bring your own or use some of the instructor’s. We’ll learn why the Quick Sketch is so key to stepping out of the box. The instructor will do a demo and then we’ll all join the fun. We will revisit our sketches from the first class, using our “What if” questions to push further. 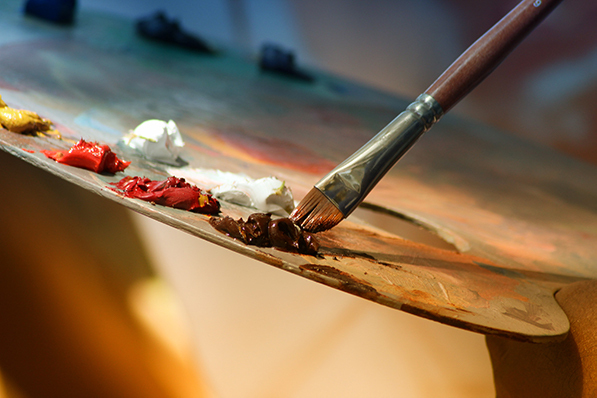 We’ll discuss composition and color choices and start with an instructor demo. We will choose our favorite Quick Sketch and start on a more developed painting. The teacher will do a demo and then provide plenty of one-on-one help. Bev would like to instill a desire in students to create meaningful paintings as well as preserve special memories in a sketchbook journal. Bev has a teaching studio, Arts Desire, in Vancouver where there are a lot of art classes presented in a variety of mediums and styles. Bev’s main mediums are oil and watercolor/ink. She spent about 13 years as a staff teacher for Susan Scheewe Publications and also has taught at various painting conventions and 4 teaching trips to K Kingdom in Taiwan which were 2-3 weeks in duration. Bev also likes to take photos of local gardens, flowers and landscapes for painting reference. Bev’s paintings are featured at the Camas Gallery in Camas. The past 2 years Bev has taken small groups of artists to the French countryside and Tuscany. This involves a lot of sightseeing, photography with the end goal of sketching/journaling to preserve those special memories in sketchbook journals. Students will become comfortable in sketching, whether it be from photos, on site to preserve memories, during day-to-day activities, at special events, or while traveling. The first week Bev will provide photo(s) to work with as a group and get comfortable sketching. The 2nd and 3rd weeks the students can provide their own photos to start preserving their own memories. Jane Aukshunas is interested in making art, gardening, and observing the natural world, in which its moods, shapes, colors, and textures are an ongoing joy. Imbued at once with both a lush sensuality and an edgy geometry, her colorful, graphic landscapes hearken back to the 1930s’ midwestern regionalist style of artists such as Thomas Hart Benton and Grant Wood. She received her BA from Massachusetts College of Art in Boston, with additional studies at Parsons School of Design in NY. She studied drawing and painting in Bali. In former lives, Aukshunas was a fashion designer and travel guide book writer and takes her sketchbook along whenever she travels. You can see her paintings at the Portland Art Museum Sales and Rental Gallery and in collections of hospitals, healing centers, and wineries throughout the Pacific Northwest. Always eager to experiment, Aukshunas has been pushing the limits of oil pastels for years and has lately segued into acrylic mediums. She leads art classes in her studio in Portland and other venues. Have fun playing with a Gelli monoprint plate in this workshop; it’s a plate that has an appealing gelatin texture. You’ll create monoprints with luscious surfaces containing myriads of unexpected colors, patterns and textures. You’ll end up with a pile of monoprints that can be enjoyed simply for themselves, or be used as a jumping off for a new piece altogether- you can use the prints you create in collage, art journaling, or for greeting cards. Please note for this class only supplies are limited: The first 10 people registered will have all tools and materials provided for a $5 materials fee; additional registrants may audit the class for a total cost of $10 (and no material fee). Register at the guild or by phone 888-801-8241. The $5 materials fee will cover all materials, including Gelli Plate, brayer, OPEN Golden Artist acrylic colors, and printing papers. You may bring your own stencils if you wish. In this class we will investigate the palette of Wassily Kandinsky, a Russian painter credited with painting one of the first recognized purely abstract works. Kandinsky was known for working on off-white canvas and using bold brushstrokes and areas of color. Exercises will include color mixing to build a color wheel and, following Kandinsky’s style, duplicating one of his paintings. If time allows, students will create an abstract painting using creative license. $5 materials fee. The instructor will supply all materials. Oil pastel is a fascinating medium that can be used both for drawing and painting techniques. In this class, you’ll be introduced to the medium and have some fun exploring it’s unique properties. We’ll draw from still lifes on smooth paper to enjoy the oil pastel “glide.” You don’t need to be able to draw well to have fun using these materials.